Former MP for Turkey's main opposition Republican People's Party (CHP) and journalist Barış Yarkadaş announced the suspensions on Twitter. "With this attitude, the board of the school says, 'Even if you are being harassed, stay silent' to the students. Those who don't is being punished", he said. After a former student of the school named Eylül talked to bianet about the harassment of the teacher S.D. 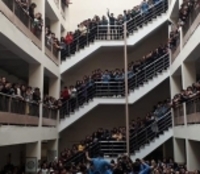 and the news was published on bianet, the students of the school launched a campaign on social media and boycotted their classes for a day in demand of dismissal of S.D. Geography teacher S.D., who is sued for harassment, was appointed to another school after the incident. An official from Ministry of Education told bianet that "his complete discharge is out of question."